Wearing a bright, beautiful smile all day can lighten up everyone’s mood. Wherever you are, smiles are almost always a universal language in a melting pot of race and culture. However, with swollen gums and cavity-laden teeth; will you still be able to do that captivating smile whenever and wherever? Obviously not! Our teeth are one of the most important parts of the body that needs to be taken care of all the time. In case you haven’t realized, our mouth is where all kinds of things go through day in and day out. Food, liquids, cigarette smoke, and God knows what. Consequently, our teeth pay the price for the build-up of plaque and cavities due to the kind of food we take in. 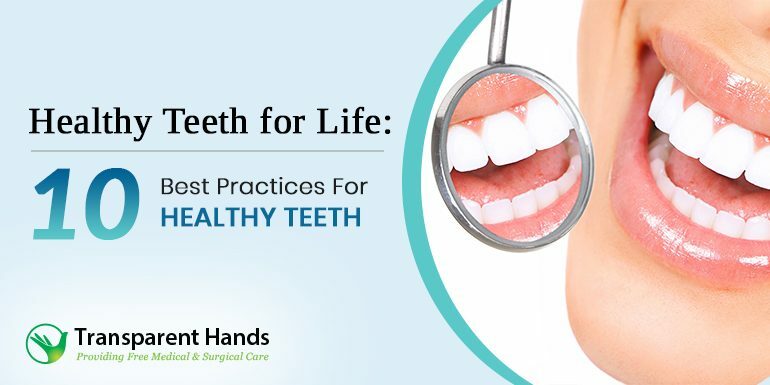 So in order to have healthy teeth for life; here are the top 10 best practices you should follow. A general rule is to brush your teeth after meals. However, if for some reason, you need to be somewhere the whole day without your toothbrush at hand; just brush early in the morning and before you hit the sack. There’s no point when you brush several times a day and not do it properly. That’s just useless. If you’re going to do it, at least do it the right way. Always hold the brush at a 45-degree angle to the gums and stroke back and forth gently. Clean the outer surface and the inner surface adamantly for two minutes. Sometimes we neglect our tongue when brushing but let me just say that the tongue can build up a lot of bacteria which are deposited to the teeth and gums. Always give your tongue a good old brushing and cleaning using a tongue scraper or your normal toothbrush will usually fill the bill. Don’t just pick the first whitening and minty toothpaste you see in your local grocery store, choose one with fluoride in it. Fluoride is responsible for preventing tooth decay by fending off teeth from germs. We always take flossing for granted and maybe because we think it’s only for getting those food particles from hard-to-reach areas in between the teeth. Partly, it’s true. However, flossing is an important part of oral hygiene. You’re not only removing the food particles but you’re also removing the plaque that has accumulated in between your teeth. It’s recommended that you floss once daily for healthier gums and teeth. Another oral hygiene practice that people take for granted is mouthwash. People think that using mouthwash is only for keeping your breath fresh. In fact, using mouthwash twice within a 24-hour period is important to reduce the acid in the mouth and re-mineralize the teeth. Swish the mouthwash for 30 seconds so it reaches all areas in the mouth. Ensure that you drink at least three liters of water daily. This not only replenishes the body but also gets rid of all sticky and acidic food and liquids that still cling onto the teeth even after a good brushing. Sugar-laden and acidic food are the main culprits of enamel breakage. Sugar is turned into acid which can start wearing off the enamel of your teeth. Make sure you stay away from sugary food and drinks. If you have a sweet tooth, it doesn’t hurt to eat sweet desserts at a minimum. You may also opt to eat fruits instead of desserts with refined sugar. Bad habits can certainly waste away perfectly good and healthy teeth and gums. As early as now, I suggest you ditch the bad habits like smoking, grinding, nail-biting, and whatnot. Smoking not only makes your breath smell bad but it also damages your oral as well as your overall health. It goes without saying that you must visit the dentist twice a year to make sure that your oral health is in topnotch shape. Your dentist will know some telltale signs of oral issues if determined early on. This way, your teeth, and gums will be happy and healthy. Maintaining a healthy oral hygiene isn’t rocket science. If you check the list, we’re most likely doing most of these anyway as part of our usual routine. If you haven’t set up your routine yet, it’s time to get those teeth and gums in check by doing these practices now! Author Bio: Annah Brooks, driven by the passion for blogging, loves to write about health care and beauty tips. She is currently working for mycomfortcaredental.com, Idaho’s #1 leader in Sedation Dentistry providing the best service in East Idaho.